서울의 중추이자 국가경쟁력의 핵심인 도심부는 도심억제정책과 강남육성정책으로 개발이 정체되면서 서울 대도시권 공간구조가 강남으로 편중되는 왜곡현상이 나타났다. 2000년대 이후 도심 재도약을 위한 다양한 정책과 계획들이 수립되었으나 실질적 사업추진이 진행되지 않고 지역 간 불균형이 심화되고 있다. 이에 서울시는 2006년 도심재창조를 위한 활성화시책의 체계화와 전략사업의 발굴 및 추진을 위한 ‘도심재창조 종합계획’을 구상하였다. 주요 내용은 도심을 역사문화축, 관광문화축, 녹지문화축, 복합문화축을 중심으로 남산과 연계하여 축별 조성방향 및 전략사업을 계획하였다. 도심부 발전을 위한 후속계획으로서 청계천 주변 활성화 및 환경개선, 도시디자인의 개선, 도시환경정비사업의 관리방향, 도심교통체계 개편, 도심활성화를 위한 대학과의 연계 등을 제시하고 세부추진방향을 제안하였다. Policies to curb downtown and foster the south of Han river have led to a slowdown in the growth of downtown that plays a pivotal role in enhancing national competitiveness. Consequently, the south of Han river emerged as the center of Seoul metropolitan structure. Despite plenty of policies and plans that aim to revitalize downtown Seoul after 2000, significant projects have failed to be implemented, complicating regional unbalance. 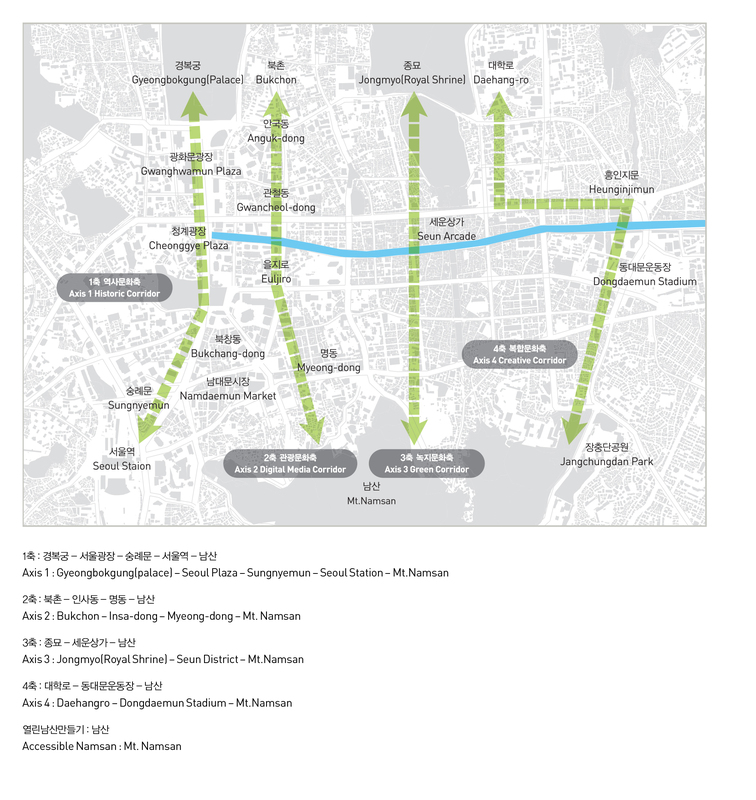 Seoul Metropolitan Government drew up 'Urban Renaissance Master Plan for Downtown Seoul', so as to systematize measures to promote urban renaissance in 2006 and push for strategic businesses. 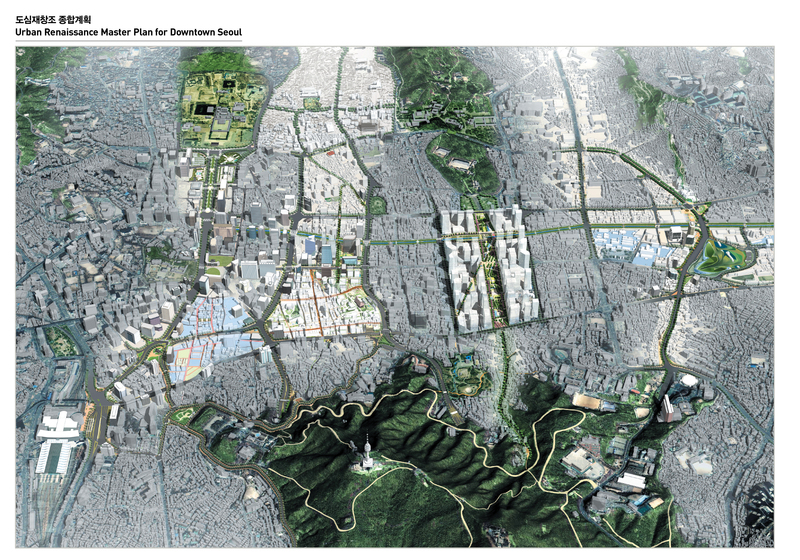 The plan came up with a future direction and strategic business by linking downtown with Namsan (Mt. ), focusing on a historic corridor, digital media corridor, green corridor and creative corridor. As a follow-up plan for urban development, the government also suggested measures to revitalize Cheonggyecheon neighborhood, create a better environment, improve city design, manage an urban renewal project, reshape downtown transportation system and connect with a university as well as its direction in detail.